Home » ccna exploration 2 final Exam » Refer to the exhibit. The network is configured with RIPv2. However, network administrators notice that communication cannot be successfully completed from one LAN to another. A network administrator issues the show ip route command on the HQ router. Based on the output, what should be done to correct the problem? Refer to the exhibit. The network is configured with RIPv2. However, network administrators notice that communication cannot be successfully completed from one LAN to another. A network administrator issues the show ip route command on the HQ router. Based on the output, what should be done to correct the problem? Disable the load balancing feature of RIPv2. Issue the no auto-summary command for RIPv2. Replace RIPv2 with EIGRP which supports VLSM. 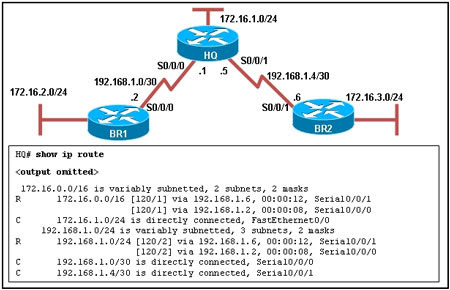 Make sure that the network statements include the correct subnet mask.